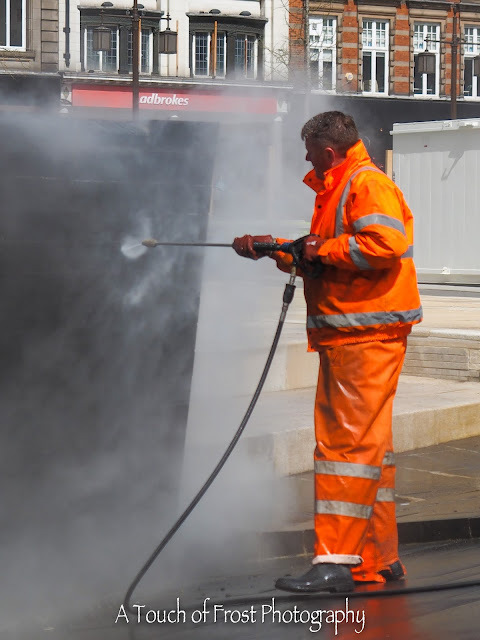 For the past couple of months, the big water feature in the Old Market Square has been surrounded by eight foot tall wooden panels, whilst some remedial work on it has gone ahead. I heard that it has been leaking water for some time, but they've only just got around to repairing it. Walking across today, I noticed that the panelling has been taken away, although it is still fenced off. But now you can see what the workmen are up to. I saw this guy cleaning part of it with a pressure washer. I believe it is going to be reopened early next month. So people will once again be able to have a paddle, or watch the water flowing over it. Although I do miss the old fountains that used to be in there. Especially when someone squirted a bit of washing up liquid in, and there used to be soapy bubbles everywhere!